sc = fitmodel(sc) fits a logistic regression model to the Weight of Evidence (WOE) data and stores the model predictor names and corresponding coefficients in the creditscorecard object. fitmodel internally transforms all the predictor variables into WOE values, using the bins found with the automatic or manual binning process. The response variable is mapped so that "Good" is 1, and "Bad" is 0. This implies that higher (unscaled) scores correspond to better (less risky) individuals (smaller probability of default). Alternatively, you can use setmodel to provide names of the predictors that you want in the logistic regression model, along with their corresponding coefficients. [sc,mdl] = fitmodel(sc) fits a logistic regression model to the Weight of Evidence (WOE) data and stores the model predictor names and corresponding coefficients in the creditscorecard object. fitmodel returns an updated creditscorecard object and a GeneralizedLinearModel object containing the fitted model. [sc,mdl] = fitmodel(___,Name,Value) fits a logistic regression model to the Weight of Evidence (WOE) data using optional name-value pair arguments and stores the model predictor names and corresponding coefficients in the creditscorecard object. Using name-value pair arguments, you can select which Generalized Linear Model to fit the data. fitmodel returns an updated creditscorecard object and a GeneralizedLinearModel object containing the fitted model. Use fitmodel to fit a logistic regression model using Weight of Evidence (WOE) data. fitmodel internally transforms all the predictor variables into WOE values, using the bins found with the automatic binning process. fitmodel then fits a logistic regression model using a stepwise method (by default). Use fitmodel to fit a logistic regression model using Weight of Evidence (WOE) data. fitmodel internally transforms all the predictor variables into WOE values, using the bins found with the automatic binning process. fitmodel then fits a logistic regression model using a stepwise method (by default). When the optional name-value pair argument 'WeightsVar' is used to specify observation (sample) weights, the mdl output uses the weighted counts with stepwiseglm and fitglm. Use fitmodel to fit a logistic regression model using Weight of Evidence (WOE) data. fitmodel internally transforms all the predictor variables into WOE values, using the bins found with the automatic binning process. Set the VariableSelection name-value pair argument to FullModel to specify that all predictors must be included in the fitted logistic regression model. Use fitmodel to fit a logistic regression model using Weight of Evidence (WOE) data. fitmodel internally transforms all the predictor variables into WOE values, using the bins found with the automatic binning process. fitmodel then fits a logistic regression model using a stepwise method (by default). 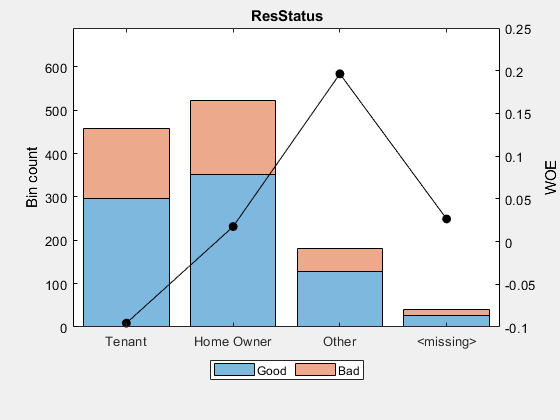 For predictors that have missing data, there is an explicit <missing> bin, with a corresponding WOE value computed from the data. When using fitmodel, the corresponding WOE value for the <missing> bin is applied when performing the WOE transformation. For example, a missing value for customer age (CustAge) is replaced with -0.15787 which is the WOE value for the <missing> bin for the CustAge predictor. However when 'BinMissingData' is false, a missing value for CustAge remains as missing (NaN) when applying the WOE transformation. Predictor variables for fitting the creditscorecard object, specified as the comma-separated pair consisting of 'PredictorVars' and a cell array of character vectors. When provided, the creditscorecard object property PredictorsVars is updated. Note that the order of predictors in the original dataset is enforced, regardless of the order in which 'PredictorVars' is provided. When not provided, the predictors used to create the creditscorecard object (by using creditscorecard) are used. Stepwise — Uses a stepwise selection method which calls the Statistics and Machine Learning Toolbox™ function stepwiseglm. Only variables in PredictorVars can potentially become part of the model and uses the StartingModel name-value pair argument to select the starting model. FullModel — Fits a model with all predictor variables in the PredictorVars name-value pair argument and calls fitglm. Only variables in the PredictorVars property of the creditscorecard object can potentially become part of the logistic regression model and only linear terms are included in this model with no interactions or any other higher-order terms. The response variable is mapped so that “Good” is 1 and “Bad” is 0. Initial model for the Stepwise variable selection method, specified as the comma-separated pair consisting of 'StartingModel' and a character vector with values 'Constant' or 'Linear'. This option determines the initial model (constant or linear) that the Statistics and Machine Learning Toolbox function stepwiseglm starts with. Constant — Starts the stepwise method with an empty (constant only) model. Linear — Starts the stepwise method from a full (all predictors in) model. StartingModel is used only for the Stepwise option of VariableSelection and has no effect for the FullModel option of VariableSelection. Indicator to display model information at command line, specified as the comma-separated pair consisting of 'Display' and a character vector with value 'On' or 'Off'. Credit scorecard model, returned as an updated creditscorecard object. The creditscorecard object contains information about the model predictors and coefficients used to fit the WOE data. For more information on using the creditscorecard object, see creditscorecard. Fitted logistic model, retuned as an object of type GeneralizedLinearModel containing the fitted model. For more information on a GeneralizedLinearModel object, see GeneralizedLinearModel. When creating the creditscorecard object with creditscorecard, if the optional name-value pair argument WeightsVar was used to specify observation (sample) weights, then mdl uses the weighted counts with stepwiseglm and fitglm. When observation weights are provided in the credit scorecard data, the weights are used to calibrate the model coefficients. The underlying Statistics and Machine Learning Toolboxfunctionality for stepwiseglm and fitglm supports observation weights. The weights also affect the logistic model through the WOE values. The WOE transformation is applied to all predictors before fitting the logistic model. The observation weights directly impact the WOE values. For more information, see Using bininfo with Weights and Credit Scorecard Modeling Using Observation Weights. Therefore, the credit scorecard points and final score depend on the observation weights through both the logistic model coefficients and the WOE values. A logistic regression model is used in the creditscorecard object. For the model, the probability of being “Bad” is given by ProbBad = exp(-s) / (1 + exp(-s)).